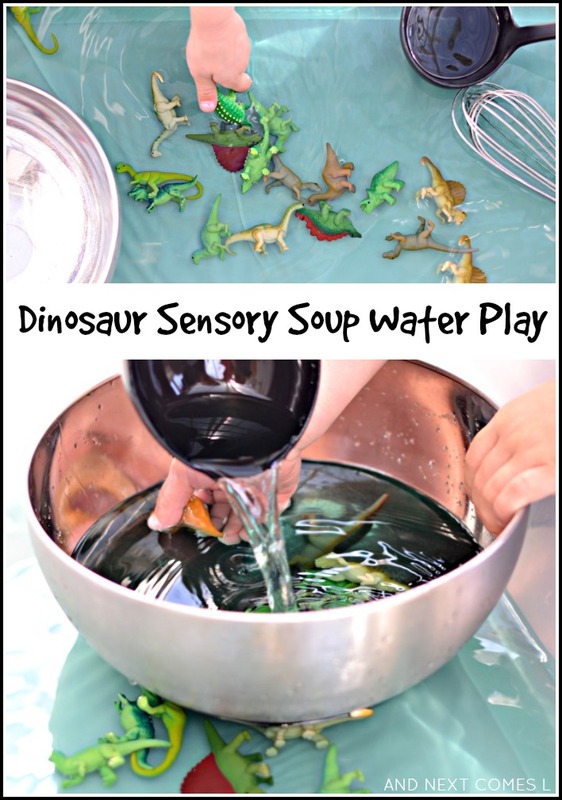 Sometimes we do activities like this dinosaur soup water sensory activity and I forget to blog about them until a much later date. Thank goodness, I Instagrammed a photo of it when it was underway to capture some of the delightful stories that my three year old told while playing with this bin because otherwise, I might have forgotten some of the hilarious bits too. Anyway, if you have never tried a sensory soup before, then you are going to get hooked on them. I love them simply because they require no preparation and they are so engaging. My kids happily play with sensory soups like this one for hours and sometimes days. This dinosaur themed one falls under the "played with for days" category. It also spawned into Dino-Basketball sensory soup. Lots of fun and perfect for a hot summer day!